Between the beautiful Indonesian islands of Sumbawa and Flores is Komodo National Park. Though the park itself is most renowned for its resident Komodo dragons, a plunge under the sea reveals hundreds of colorful species of fish, manta rays, corals, turtles, and more. 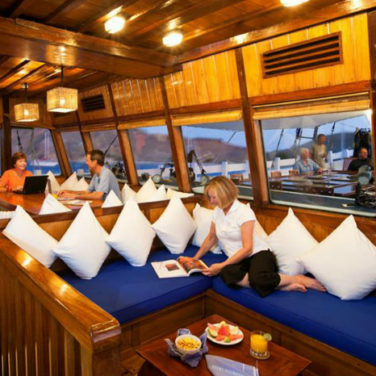 To see for yourself, here are our ten suggestions for the best Komodo liveaboard boat to go on. The dive sites in Komodo are known to have strong currents and offer a variety of dive conditions ranging from rocky, to deep, to coral gardens, within the park itself. There are over forty sites to choose from and experiencing the park from a liveaboard is the only way to reach sites that are hard to access – but totally worth it once you do. 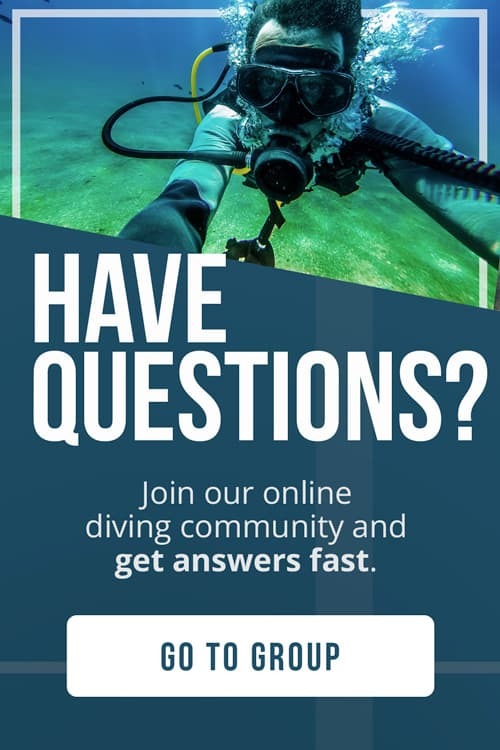 If you’re not already an experienced diver, consider getting your advanced open water certificate or refreshing your dive skills with a few fun dives before hopping on board. 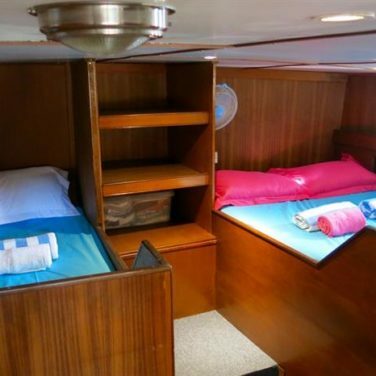 Divers on a budget don’t have to sacrifice service and comfort to experience a liveaboard in Komodo. 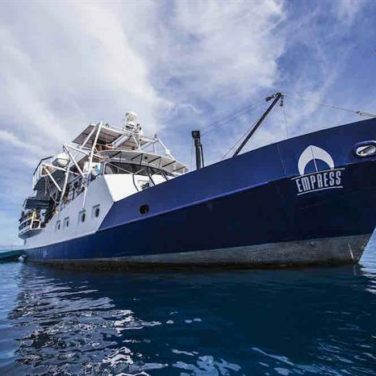 The Empress II keeps costs low with buffet-style meals, casual ambiance, and options for shared cabins and toilets. This highly rated boat is one of the region’s best options thanks to extra features like Nitrox, a dive elevator, and onboard recompression chamber. 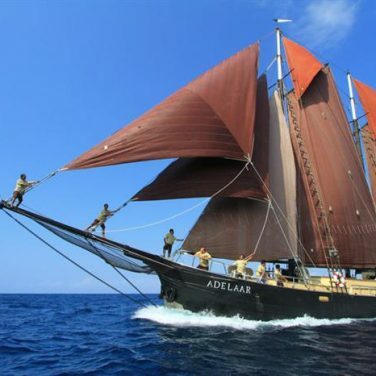 If you’re looking for the classic Komodo experience, this traditional Phinisi is your best bet. 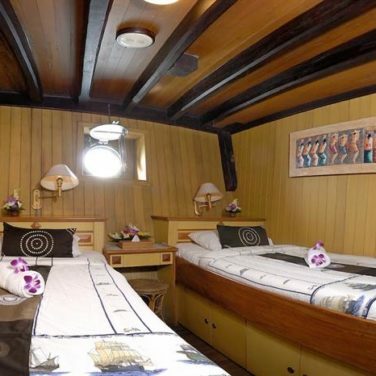 Modern cabins, shore excursions, small diving groups, and excellent online reviews make this a solid choice for divers of all kinds. 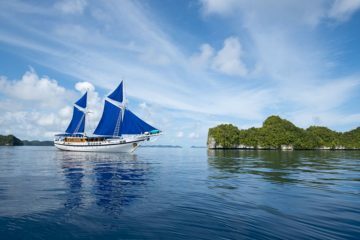 If you’ve already dived Komodo, or you’re just looking for something different, this boat’s itineraries around Flores might be your best bet. Stops around Alor, Maumere, and Bima reveal seldom visited reefs, flourishing wildlife, and special encounters with lesser seen species like dugong. 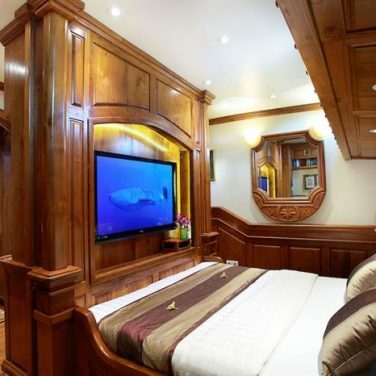 Photo enthusiasts can enjoy dedicated rinse tanks and camera stations, an updated photography room, and large screen television for viewing their best shots while onboard the Ambai. 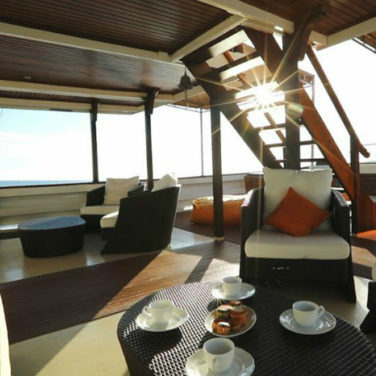 Other photo-friendly perks on this boat include extra charging points in every cabin, free Nitrox, and specialty cruises hosted by Bluewater Photo. 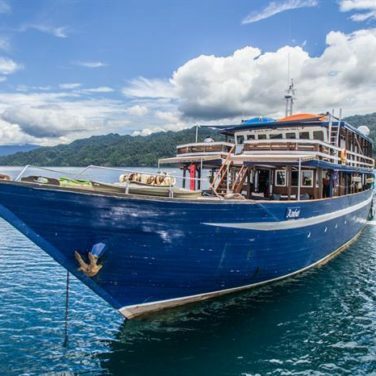 For divers with a flexible budget and timeline, this liveaboard’s 10 day itineraries are a top pick. These over the top trips explore all of Komodo’s best dive sites, include multiple shore excursions, and even visit nearby wrecks and reefs. 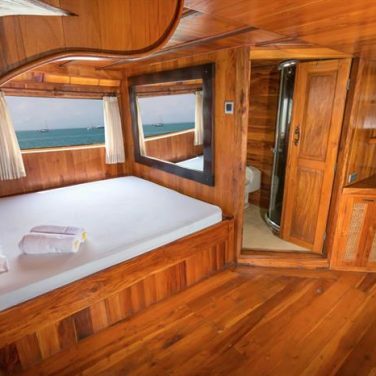 More like a high-end hotel than a boat, this Dutch Schooner is the perfect place to relax in high style. 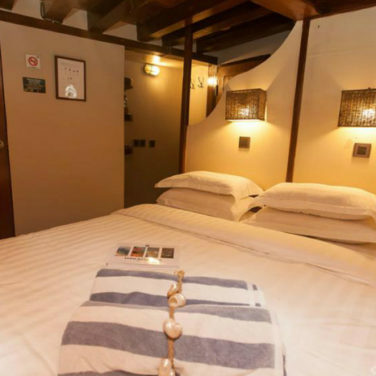 Suites and staterooms are well appointed, and guests can expect little perks like chef-prepared meals and a full bar. Advanced. There’s no way around it, Komodo National Park is not a dive destination for newbies. The region is home to legendary drift diving and strong currents. Challenging surface conditions are common too, making this area best for experienced divers. 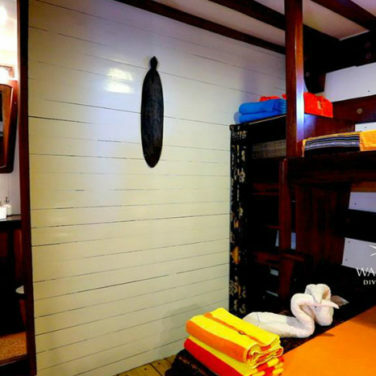 Most liveaboards in the area require an advanced level of certification and a minimum of 50 logged dives. 6 to 10 days. If you’re looking for a quick trip, you’ll find plenty of 3 and 4 day itineraries in Komodo. But, the best dive sites take longer to reach. And, no visit to these islands is complete without paying a visit to the region’s most famous residents, the Komodo Dragons. Plan for at least one week to take it all in. 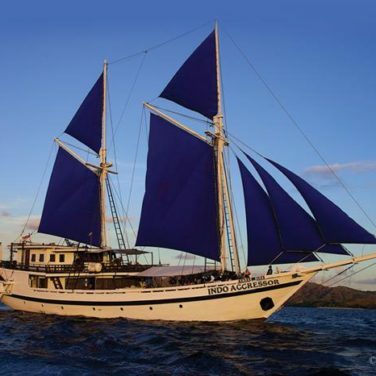 The liveaboard season in Komodo runs from April through August. Though there is still plenty to see in the offseason, scuba divers can expect rough seas and choppy surface conditions. Divers in Komodo National Park should plan for heat and humidity, even during the dry season. Sea temperatures vary dramatically from 68 to 82° F (20 to 28° C), and a 5mm wetsuit is your best bet in the park’s cold currents. The viz in Komodo National Park ranges from 16 to 98 feet (5 to 30 meters) throughout the year. The plankton in these waters often reduces visibility but also invites massive schools of fish, manta rays, and even whales, to feed. Komodo National Park is one of the wildest places on planet earth, both above and below water. You can expect fast-paced drift dives, encounters with large pelagics, and some of Asia’s most biodiverse reefs. This stunning region features remote seamounts, delicate coral gardens, plunging walls, and pinnacles. Photographers should pack for macro and wide-angle shots, and video if possible. Active volcanoes, dinosaur-sized lizards, and the famous Padar Island Hike make land-based activities worthwhile, even if you typically skip shore excursions. Throughout Komodo, plunging pinnacles and walls invite great hammerheads up from the deep to feed and visit reeftop cleaning stations. The sharks are frequently encountered below 30 meters, cruising in strong currents. Despite their size, hammerheads are quite shy. So, the more remote dive sites you visit, the better your chances are for an encounter. 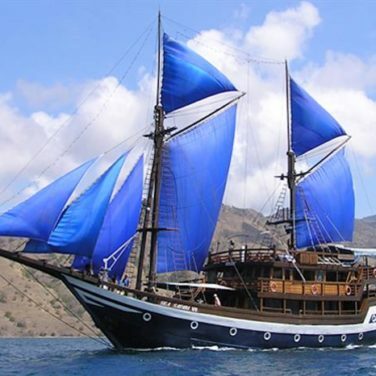 Many liveaboards venture east of Komodo to Alor, where schools of 50 or more are often encountered out in the blue. No matter what part of the park your liveaboard visits, you have a good chance of spotting manta rays. Pinnacles, seamounts, and walls, set the stage for their dramatic feeding and cleaning behaviors. Dive sites like manta alley guarantee encounters on every dive, often with groups numbering in the double digits. 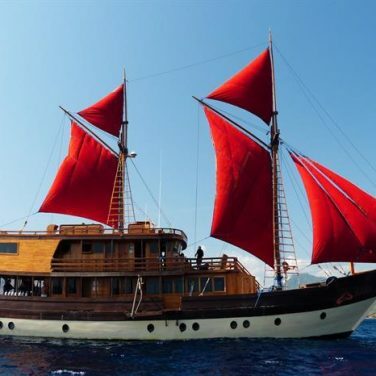 Komodo National Park is a liveaboard destination best suited to experienced divers that are comfortable with strong currents, open ocean conditions, and fast-paced drift dives. You should be prepared to make negative descents, and use a reef hook to hang on at some cleaning stations. Pack more than one surface signaling device, including an extra tall SMB. 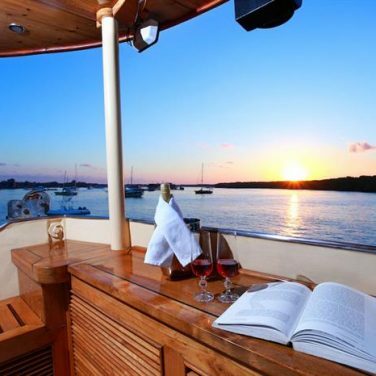 Many liveaboard divers prefer to opt out of shore excursions. But, in Komodo, they are well worth your while. The Padar Island hike promises the region’s best views and most iconic photo opportunities. 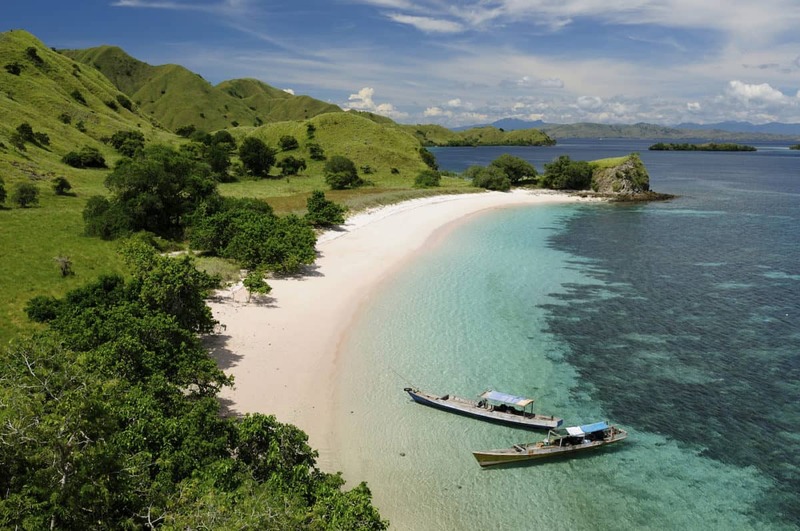 And, this trek combines effortlessly with a visit to Padar’s colony of Komodo dragons. These massive lizards also inhabit Rinca, Flores, and Gili Motang. 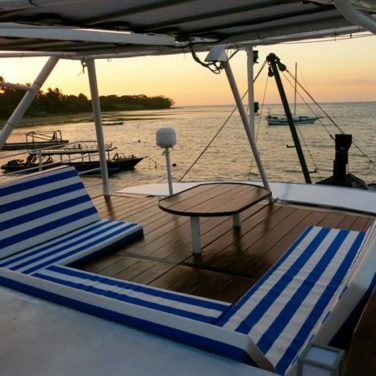 Komodo National Park is massive, and only liveaboards visit the most thrilling and remote dive sites. 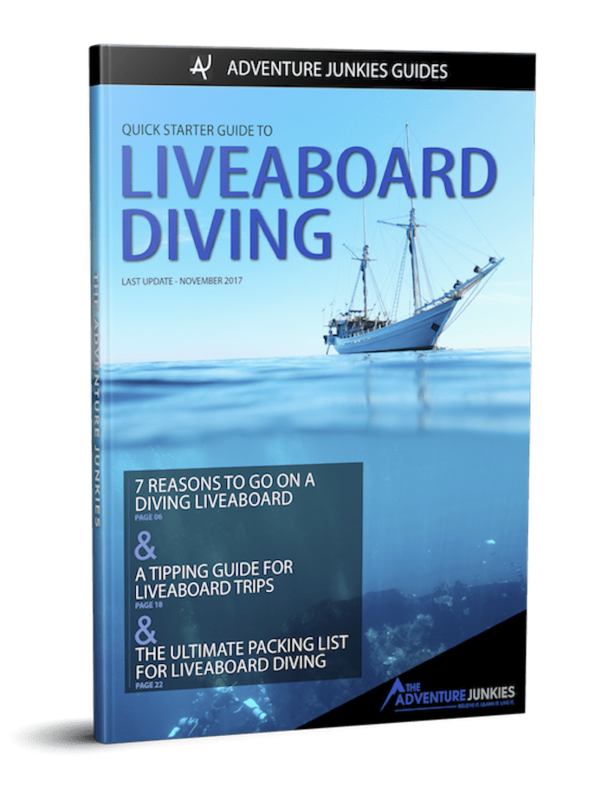 Where your itinerary stops will depend on the time of year, length of trip, budget, and goals of your fellow divers. Classic routes in the park include “best of” itineraries, focusing on the most popular sites within the park. These quick trips are perfect for divers on a budget, or with limited vacation time. Komodo’s northern dive sites are warmer and clearer than the South. 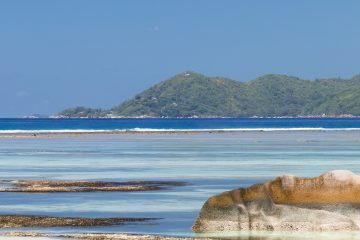 Divers can expect thriving and colorful coral reefs, and calmer conditions than the south, too. This region is also home to massive submerged pinnacles, perfect for spotting large schools of trevally and mackerel, sharks, and turtles. Southern Komodo is known for cold, and sometimes murky water. These upwellings of cool water, rich in plankton, invite a stunning variety of marine life to feed. Pelagic giants like hammerheads and manta rays gather patiently at cleaning stations while dolphins, whales, and sunfish cruise by out in the blue. All that plankton supports a wealth of macro-life, too. Some of Komodo’s best muck sites can are in the far south. 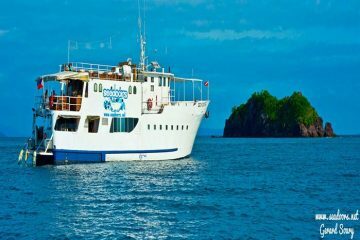 Extended liveaboard itineraries venture outside the park, visiting eastern and western sites around Flores. Alor is quickly gaining popularity thanks to world-class muck and drift diving. These eastern sites are great for spotting everything from the elusive blue ringed octopus to the mighty hammerhead shark. If you’re looking for macro life, far western sites around Bima are a good bet, too. Though northern Komodo is home to milder currents than the south, submerged sites like Castle Rock and Batu Bolong aren’t for the faint of heart. These deep and challenging dives are home to massive schools of jacks and barracudas, sharks, and manta rays. Most boats spend multiple days exploring these pinnacles and seamounts. Dives around the small Tatawa islands are perfect for exploring the north’s vibrant and colorful coral gardens. Located in the far northwest of Komodo National Park, this island is best known for steep sloping reefs and walls. Sites like White Angels feature some of the area’s most stunning sponges and corals, teeming with thousands of colorful reef fish. Large pelagics like mackerel, tuna, and reef sharks patrol the dropoff. And, nearly every liveaboard in Komodo visits the famous GPS Point. This seamount is overgrown with delicate hard and soft corals, hosting an incredible variety of macro species. Venture deeper for encounters with hammerheads, reef sharks, and schooling batfish and snapper. Every diver in Komodo wants to see a giant oceanic manta ray, and southern dive sites like the aptly named Manta Alley offer them in abundance. For a nearly guaranteed encounter, the cleaning stations in this otherwise unremarkable channel are your best bet. Reef sharks and napoleon wrasse wait for a good scrub down on these same coral bommies. Sweeping currents and sheer rock walls promise high-adrenaline drifts at thrilling sites like End of the World. It is in these colder, plankton filled waters that Komodo liveaboard divers are most likely to encounter super-sized animals like mola mola, whales, and dolphins. Some of Komodo’s most beautiful coral cardens are found of the southern coast of Rinca Island. Sites like Yellow Wall benefit from strong natural lighting, and some of the park’s best visibility too. This photographer’s favorite is a reliable place to spot the rare clown triggerfish. Nearby, submerged pinnacles like Pillarsteen and Cannibal Rock are home to an incredible variety of creatures, from miniscule to massive. Photographers should plan for both macro and wide angle. These sites are notorious for swift top-currents, but are much calmer at depth. West of Komodo, the island of Sumbawa is home to some excellent dive sites, especially around Bima. Shallow, fringing coral reefs, steep walls, and outstanding muck diving are highlights in the area. Nearby, Sangeang Island offers unique topography with lava tubes and bubbling underwater vents. The black, volcanic sand sets the perfect stage for macro identification and photography. One of Southeast Asia’s best-kept secrets, Alor has it all. The current swept pinnacles and seamounts host manta rays, hammerheads, and large schools of reef sharks. Protected bays of nutrient-rich volcanic ash and sand create a stunning backdrop for what is often called Southeast Asia’s absolute best muck and macro diving. 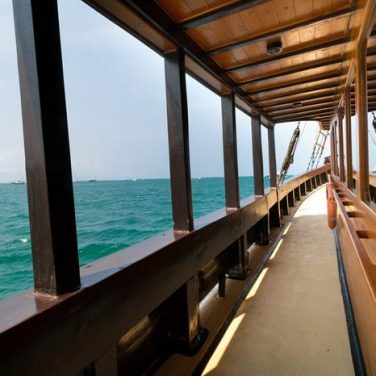 And, you probably won’t see another dive boat once during your visit. If your focus is on underwater photography, Alor should be at the top of your list. An excellent variety of guided photo workshops is available in the region. Though much of the coral reef around Maumere has been damaged by dynamite fishing, and the tsunami in 1992, there is still plenty to see underwater. These rubble bottoms make for exciting macro “bug hunts,” and are excellent for spotting juvenile reef fish. Photographers should plan for outstanding macro and silty conditions. Most liveaboards passing between Komodo and Alor stop here for a day or two.